Here are a few interesting graphs on the Natural Gas (NG) supply situation. The current oversupply has led to a sharp drop in exploratory and development drilling for NG in the US. Also show is the record levels of US oil drilling. Exploratory drilling in the US has come to a complete halt. 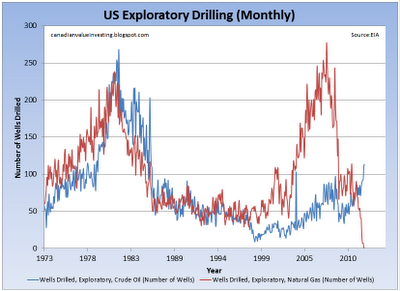 In both May and June not one exploratory gas well was drilled in the US. Since March of this year only 14 exploratory gas wells have been drilled. 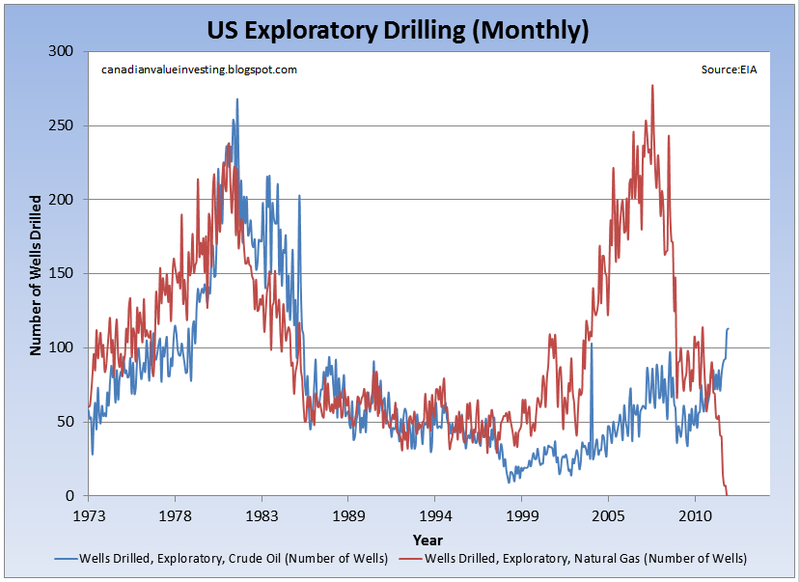 Meanwhile exploratory drilling for oil is at the highest level in 27 years. 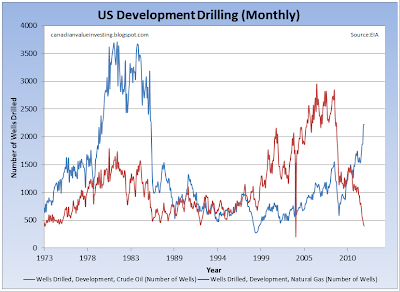 As seen in the above graph, development drilling for gas has finally fallen to decade lows. 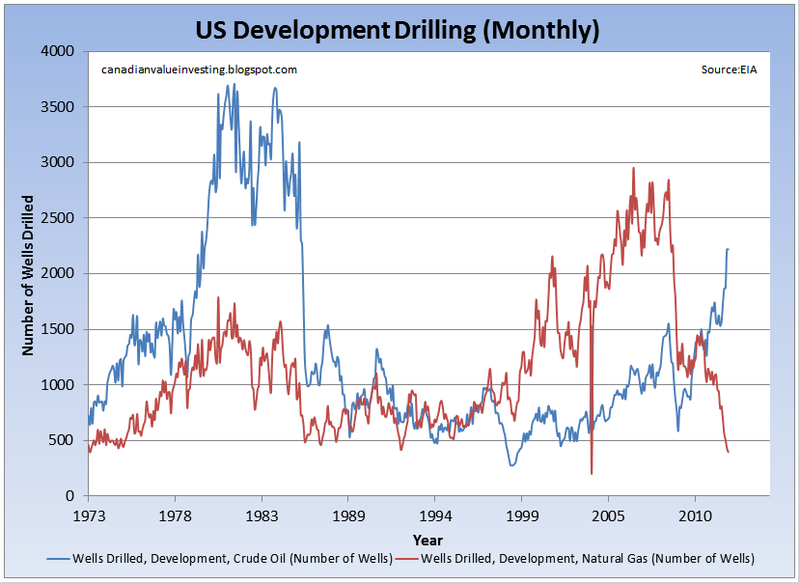 We have not seen this low of a level of development drilling since the mid 1990's. Low gas prices are finally starting to have an impact. By comparison, oil development drilling is at a 26 year high and for good reason, oil prices are in a bubble. This has led to an explosion in oil production in the US. Due to the strong exploratory and development drilling for oil, crude oil production in the lower 48 is at a 23 year high as seen above. The increase in production over the last couple years is quite remarkable. 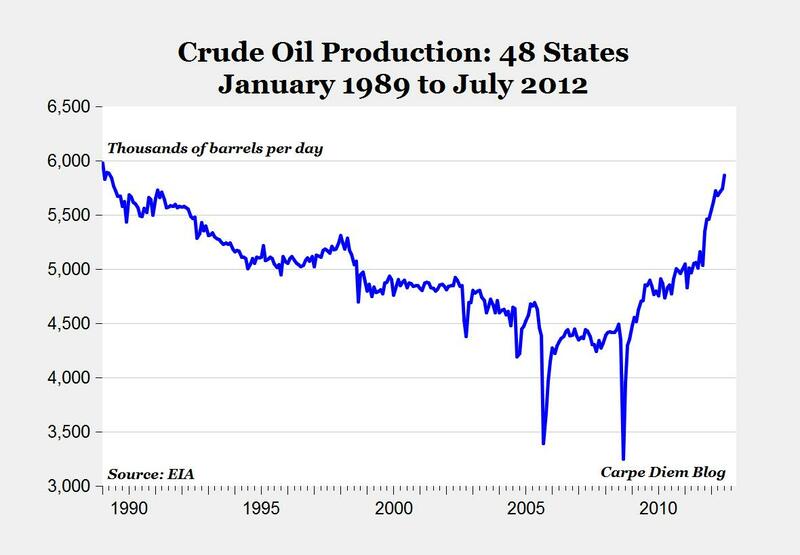 So much for peak oil, as many bloggers have aptly named peak idiocy. I have commented before how peak oil theorists misunderstand basic economics, especially how price impacts both technological advancement and substitutionary effects. The bottom line is that oil production is strong and growing in the US. Couple this with weak global demand, especially from China, crude oil is likely to fall. I can't tell you when but it will fall. As for NG, low prices have finally taken their toll as exploration and production companies have nearly stopped drilling. One of the main exceptions to this trend is Peyto, who has 8 rigs running as of the end of August. That makes them the second most active driller in Alberta for 3000+ meter rigs. It will be interesting to see how fast the production response will be to the decreased natural gas drilling. The sooner the better, I hope. I am a Professional Engineer & MBA from Canada. I am passionate about value investing and find most value investors don't understand what value investing really means. All investment ideas will be simple and have a margin of safety. If you are looking for true deep value investing insights and stock analysis, you've come to the right blog. I've been profiled on the Globe and Mail’s “"Me and My Money” series and in Canadian Business. Copyright 2010-2014. Ethereal theme. Powered by Blogger.